Areas affected by the red flag warning. 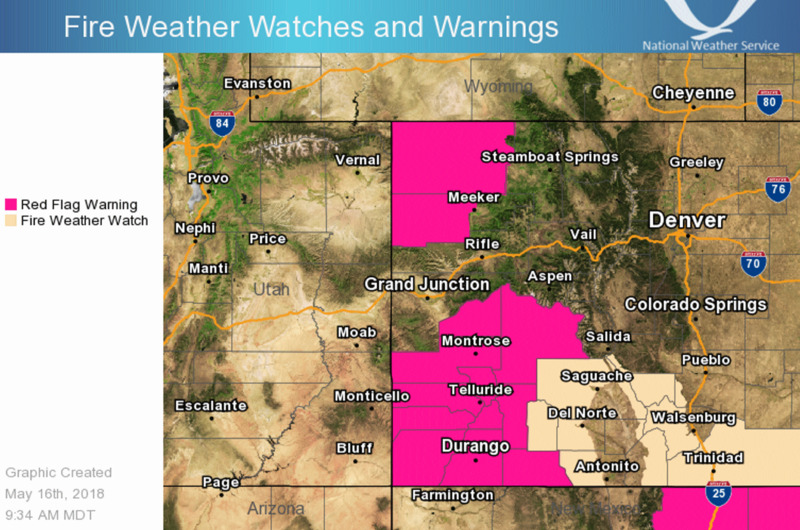 A majority of Southwest Colorado will be under a fire weather watch until to 9 p.m. Thursday. The National Weather Service issued the watch as the result of a low-pressure storm that will bring dry and windy conditions to the area, which spreads as far north as Gunnison. The Durango area can expect 15 to 20 mph winds with gusts up to 35 mph and a relative humidity of roughly 8 percent, according to the NWS. The conditions make existing and new fires harder to control. La Plata County has been under stage 1 fire restrictions, which prevents campfires and open burns, since May 1.